Well known brand Polycab Wires Pvt. Ltd. is in the business of manufacturing wires and cables since 1973. It is India’s largest wire and cable manufacturer and market leader both in the cable and wire segments with presence across various sectors and products which includes among others – LV, MV, HV, EHV Power Cables, Instrumentation and Control cables, Telecommunication Cables, Optical fiber Cables, Submersible Cables etc. In addition to wires and cables Polycab has FMEG products such as fans, LED lights, pumps, switches, MCBs, Solar products etc. in its portfolio. The relatively new FMEG segment contributed about 494Cr. to the company’s top-line during FY18. Polycab Wires also has the largest Sales Channel network of dealers / distributors among cable & wire manufacturers in India. The company is now coming with it’s Initial Public Offering (IPO) which shall open on 5th April and conclude on 9th April 2019 with price band of INR 533 – 538 per share. The IPO is expected to be valued at around INR 1350 Cr.. Of this 400 Cr. would be channeled into the company through fresh issue of shares and remaining 950 Cr. would be towards secondary offer ing of approx. 17.6% of the company. Of this 17.6% approx. 10.1% shares would be from promoter holding whereas 7.5% would come from International Finance Corporation (IFC) which presently holds 15% of Polycab Wires. Post IPO the promoter shareholding in Polycab would fall to 68.7% from 78.9%. The IPO proceeds of INR 400 Cr. would be partly used towards INR 100 Cr. of debt redemption of the total approx. INR 600 Cr. debt in books, INR 200 Cr. would be utilized towards the company’s incremental working capital needs and INR 100 Cr. would be used for various ‘corporate purposes’ as per Mr. Ramakrishnan Ramamurthi, CEO of Polycab Wires in an interview with CNBC TV18. According to Mr. Ramamurthi, the company’s CAPEX plans would be met through internal accruals. and money through IPO would be largely utilized for better efficiency of operations. Polycab accounts for around 18% of the organised Cables and Wires market in India which as of FY18 stood at INR 34,600 Cr.. When the unorganised market is also considered, Polycab accounts for approx. 12% of the total Cables and Wires market of around INR 52,500 Cr. in India. 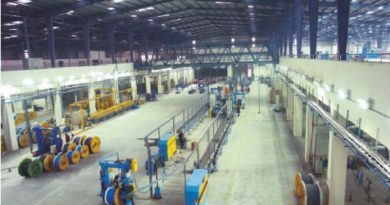 In terms of broad infrastructure setup the company has 24 manufacturing facilities, around 3,300 dealers and presence at over 1,00,000 retail outlets across India. Thus it holds a dominant position in the Indian Cables and Wire Industry. According to Mr. Ramamurthi’s interview with CNBC TV18 Polycab commands healthy margins in the Wire and Cable Industry with EBITDA of approx. 12.7%, with profit margins of wires segment being more than that for cables segment. Also as per him the company has seen a 14 – 15% CAGR over the last 3 years which is much better compared to CRISIL’s estimates of 11% CAGR over the last 4 years for the Indian Cable and Wire Industry. KEC International wins fresh Orders worth 1781 Cr.